Summary: For the past three years, the Marinelife Center has led an immensely successful leatherback tagging program on the beaches of Northern Palm Beach County, identifying 116 individual females. This project will continue this effort, and for 2004 season, add satellite telemetry studies to delineate internesting habitat and physiological studies to examine environmental stresses on nesting females. 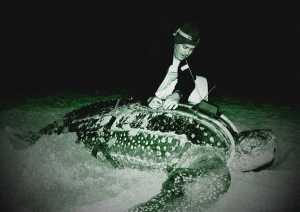 There has been a significant increase in the number of leatherback sea turtle nests over the past decade in Florida. This increase could represent the rapid colonization of Florida beaches, this phenomenon has been observed for other Caribbean beaches. It is critical to collect baseline population information for this important nesting aggregation with the goal of contributing data to an effective management plan.